Should we lower our expectations? My cousin recently commented to me that the key to childrearing was to accept that you were never going to get enough sleep and always be tired. The longer you tried to fight that acceptance, the more miserable you became. I think this can be said about so many difficult things in life – once you accept them they stop making you unhappy. But does this mean we should have lower expectations? Should we be satisfied with our lot or should we expect more? Something often stops me from being satisfied with my lot, and drives me to change things for the better. Is that such a bad thing? I was struck by the chart below of Japanese attitudes. As incomes have risen, so have expectations, meaning that no one actually seems to enjoy the extra income (life satisfaction in Japan has stayed flat, even as incomes have risen). There is a similar picture in the UK. 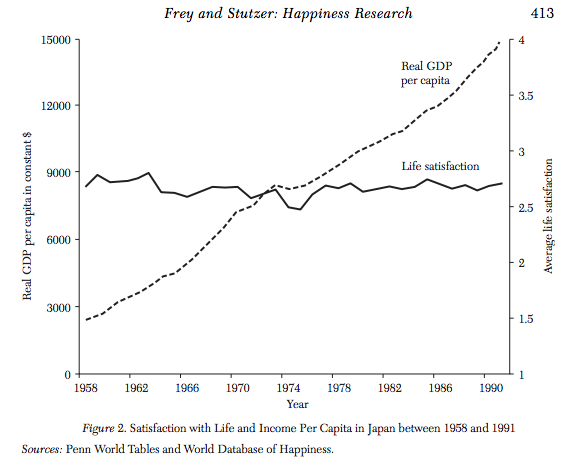 Since 1970 UK GDP has doubled, but life satisfaction has hardly changed. The second is to trick your expectations every now and then by mixing things up. I don’t get a huge amount of daily happiness from a hot bath and sleeping in a comfy bed. But after camping for a couple of weeks these amenities feel like complete luxury.